Reid Bollinger is regional sales manager at Delta Computer Systems, Inc., Battle Ground, WA; 360/254-8688; www.deltamotion.com. Joining workcells together and streamlining output from one stage to the next, if done correctly, is a surefire way to boost metalforming productivity. One company proving this out, Dayton Parts, Harrisburg, PA, manufactures for the vehicle aftermarket. Part of a manufacturing operation that dates to the 1920s, the company’s leaf-spring production process was upgraded this past year to automate and connect the leaf punching and forming processes into a smooth flow (Fig. 1). Fig. 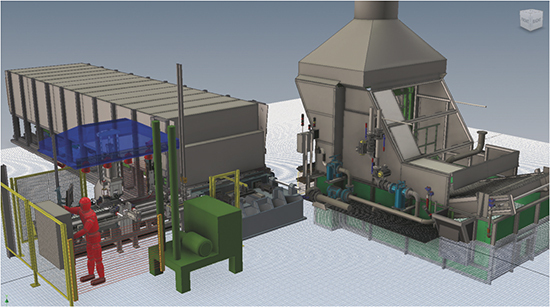 1—This CAD rendering shows the forming station (right) and the punch press (left), with the furnace in the middle. Leaf-spring material moves right-to-left from the furnace to the punch press, and then left-to-right to the forming station. 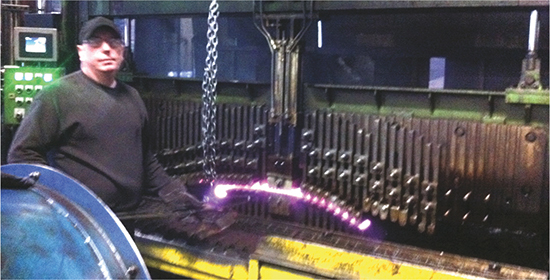 Dayton Parts’ leaf springs, made from 1⁄2- to 1-5⁄8-in.-thick 6150-grade high-carbon bar stock, must be heated to 1800 F in both punching and forming production steps. Before the streamlining upgrade, this meant heating the springs twice. Now, with the new closely coupled arrangement, the leaf springs need only one heating prior to punching and forming, saving energy and time, and as much as doubling process throughput. The integrated Dayton Parts workcell has proven the advantage of close coupling and networking of processing stages. The updated line has reduced reheat and changeover downtime to a minimum, while achieving cycle times as short as 17 sec. per part. Fig. 2—A detailed rendering of the hot punch shows the six motion-control axes used in its operation. Achieving rapid cycle times for the combined machine requires precise control and close communication between the motion operations performed in the process stages. Supervisory control is performed by a programmable logic controller (PLC), but to control the individual motion axes, PLCs with special capabilities for multiaxis coordination are required. At the recommendation of local distributor Penn-Air & Hydraulics of York, PA, Dayton Parts’ engineers chose the RMC150 and RMC75 motion controllers from Delta Computer Systems, Inc., Battle Ground, WA. The hot punch for the leaf-spring process is powered by six motion axes (Fig. 2) under control of the RMC150—no problem, as a single RMC150 can control and coordinate the motion of as many as eight axes simultaneously. A pusher axis advances the part against an end gauge, which is positioned by another motion actuator to oppose the pusher in order to set the length between the end of the plate and the center hole to be punched. Two centering jaws along the width of the plate activate to center the hole accurately along that width. The pusher and end-gauge axes travel via position control, while the centering jaws use position and force control. One jaw moves to a target position and the other jaw uses force control to clamp the part. Fig. 3—The forming head establishes the bend in the leaf spring, which can be seen glowing hot. After the bend is established, the whole forming head lowers into quench oil to harden the leaf and set the bend in its final position. “The ability to combine different types of axis control in one system was very helpful,” says Greg Shortridge, Dayton Parts electrical engineer. “Using position and force control, we can ensure that the parts are securely held, at the same time avoiding the risk of damage due to clamping them too tightly. The last two of the six axes operate the punch, a 10-in.-bore hydraulic cylinder operated by a servo-hydraulic valve, and stripper. Magnetostrictive displacement transducers provide position feedback for the hydraulic cylinders that operate the punch, stripper and centering jaws, while the end gauge is positioned via a servo motor with absolute encoder to provide position feedback. The pusher, operated by a hydraulic cylinder, also uses an absolute encoder indicating position. Fig. 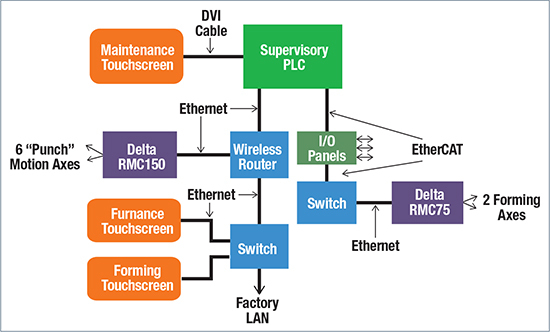 4—This Network Architecture screen shows the main PLC, remote I/O panels, the three 15-in. operator touchscreens, network switches and router, and the two new motion controllers. All information screens and operator functions are available from any of the three touchscreens. The forming head is operated by two motion axes, one to clamp the part in the frame for bending (Fig. 3) to its desired shape, and the other to move the frame vertically. The clamp uses automatic pressure control when it engages, ensuring that the part clamps to a specific pressure in the form that establishes the appropriate bend to the leaf spring. This is accomplished via a PLC and automatic pressure regulator in conjunction with a proportional valve. When clamping the part, pressure is controlled via the regulator. When unclamping, an RMC75 two-axis electrohydraulic motion controller uses the proportional valve to smoothly open the form to the desired positon, adjustable by the operator for convenience. The second motion axis in the forming head, also controlled by the RMC75, lowers the frame into a quench oil bath to harden the part and set the formed curve. The motion controller uses position control to raise and lower the frame, controlling the cylinder via a proportional valve. Dayton Parts upgraded the leaf-spring operation in three phases, tackling the furnace, the hot punch and then the forming head. Each phase required four days of work over extended weekends to minimize downtime. 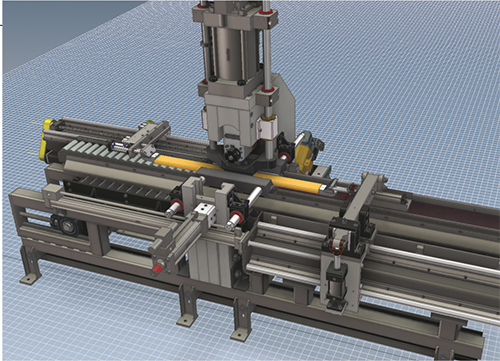 The combined Dayton Parts punching and forming workcell provides an example of how machine-to-machine communications can improve a process. The supervisory PLC, connected via a standard Ethernet network, interfaces to the two motion controllers and multiple human-machine-interface terminals, and via EtherCat (an Ethernet-based fieldbus) to a series of input/output racks (Fig. 4). Communicating via the networks, the PLC adjusts cycle time of the furnace and sets the speed of subsequent stages in the line. For maximum productivity and also to ensure that heat transfer from the hot parts passing through the system doesn’t affect sensitive system components, it is critical that the process proceeds as smoothly and expediently as possible. Fig. 5—The Dayton Parts system uses recipes, selectable using the touchscreens, to streamline production changeovers and ensure repeatability of the leaf-spring manufacturing process. The local machine network also connects to the factory LAN so that production information is available to corporate SPC and quality-analysis software. This can help optimize performance and identify maintenance issues before they escalate. 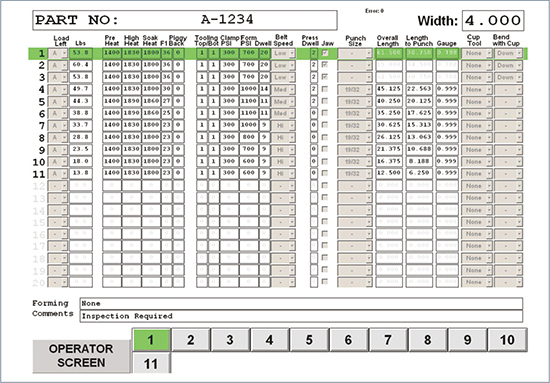 The PLC connects to a Microsoft Access database containing the manufacturing parameters of all leaf springs produced by Dayton Parts. The operator selects the leaf spring to make next via a touchscreen interface and the PLC downloads the appropriate process parameters to the temperature/pressure controllers, and motion sequences to the Delta motion controllers. To tune the motion, Shortridge used the set of tools provided by Delta Computer Systems. One of these tools, Plot Manager, enables the designer to visually and numerically compare an axis’ desired motion trajectory with the actual motion profile observed in a test run. With this visibility, control-loop parameter gains can be tweaked and the system re-run until the target and actual positions overlap on the plot, showing that the system is perfectly tuned.